The 200 Trendline Break is another of those Renko Trading Strategies that is relatively simple to execute and appears on the charts of almost every instrument, be it forex, stocks or futures. 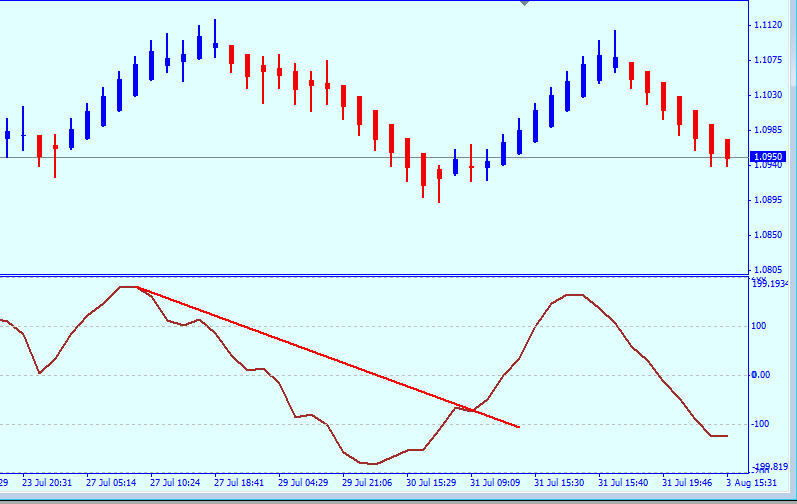 This trade involves using only the CCI indicator and and a trend line. What is important is that the CCI has reached approximately 200 level from where we can draw the trend line to intersect the CCI. You can see that the line was drawn from the top of the CCI, which is close to the 200 line, and intersects where there is a bump on the CCI moving up.. When you look up at the price bars you will see that the bar is a valid entry point and that there is a relatively good move upwards. This one will take some practice to recognize and master, however the time is well worth it as this pattern gives some excellent profits. By the way, this chart is made of 20 pip Renko Bars which is my own preference. So,me people prefer smaller bars and some people prefer much larger bars. Of course this trade can be made with short trades as well as long trades, I have only illustrated a long entry on this chart. Again, this is a simple concept requiring only one indicator. Please look elsewhere on this blog to see other Renko Trading Strategies.